Include your Happy Tail story for all to enjoy! We adopted Nattie from Ark August 2013. She was about a year and half. She has grown into the most sweetest, well behaved pup; we adore her! We've never had a dog so intelligent and playful. She does love to dig; but at least she digs with a purpose, she loves to sunbath in her "holes." Thank you ARK volunteers and supporters! Jennifer B.
I just have to say Trudy has been a blessing. She came to us in early October after the loss of our peke. 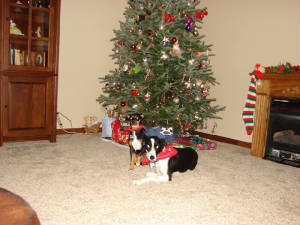 Who we had for twelve years..we thought Trudy had been adopted and were heart broken. Miracle of miracles she hadn't and she is with us now..
On the porch; with cat friends and sharing ice cream!! I wanted to send a 1-year update on our little furry friend, Peaches, or, as she's now known - "Monty". We have absolutely loved having her in our hearts and our home. If you recall, we have 4 cats, and it took a while for them all to become comfortable together; now, they get along great. She is a very happy and loving dog. She loves to meet new people, take walks, go for runs, and go for car rides. My husband has a shop on our property, where he runs his small business, and she loves to hang out with him all day. At night, she sleeps right next to us on her own little bed. She's rather spoiled :-) Thank you again for finding her and keeping her safe until we adopted her! Submtted by G. W.
Annie is now 3 years old and such an amazing part of our lives. I just wanted to share a pic of her. 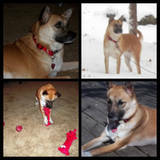 I adopted Karlee from ARK in July, 2010. 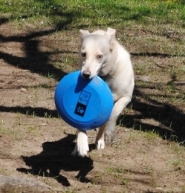 She loves to play with her Frisbee. In fact, she grabs it every time I go outside with her. You can tell from the pictures how much she enjoys it. I am a lucky, happy boy! My "Mom" is the Best Mom Ever!! Duke was rescued after he suffered in pain many days of his life. The Vet said he was a lucky boy to even be alive. 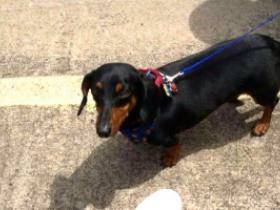 He had many injuries including a broken paw and deep cut on his neck. Look at Duke now! Living the perfect Doggie Life in Boston, MA. "A Day In The Life Of Simon "Chuck" Patton Bell"
Simon goes on 3 walks per day, any less he chases the cats. They tolerate Simon but are not impressed with him most days. No meaness just annoyance. On Sunday he goes to the pet store to pick out a toy. He literally picks out the toys. Sooooo funny. Everyone at PetSmart greets Simon by name. Simon also loves to mole hunt and he is very good at it, he hasnt brought me one yet but I know its just a matter of time. I am certain lil dog will one day dig to China. Thank You for rescuing him and choosing us. Simon has brought such joy to our lives. P.S. I don't even want to go on vacation because I dont want to board him. Yep......Wrapped around his paw I am. She has a new home and is very happy!! 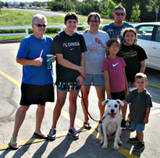 Rascal is a loyal running partner, logging 30+ miles each week running with Alex and his pack of boxers. The small boy, upon meeting Rascal, turned to his mom and said, "Let's take him home!" We adopted Scruffy last may, he has made himself at home with our family. He plays with us, walks the neighborhood with us. Although, car rides are not his thing to do, he gets sick easy. He knows where his spot is on the couch. He even tries to steal the remote control sometimes! Scruffy has made us laugh, and proud. This has been the absolute best dog, we never had to work at house training him, from the very first day we got him, he went and scratched at the door to go outside. When we leave during the day to run errands, he posts himself on the couch or on one of the beds and waits for us to come home. Scruffy is not the type of dog to take a bath, but take him to the park.....he jumps right into the water. We Love him!!!! 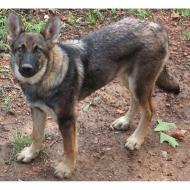 We have since found him a playmate, a german shepherd named Max. They play and scuffle, but get along just great. Thank you ARK for Scruffy. 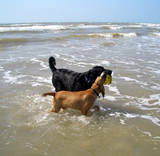 "LOCAL GROUP GATHERS ITEMS TO DONATE TO ARK"
Playing in the water is fun! A few Recent pictures of Landry and his dad, Gary, taken in the backyard. Landry learned to use the dog door the first day by watching a cat go through it. He is enjoying the yard more now that it isn’t 100 degrees every day. Landry has completed four weeks of PetSmart Puppy Education classes and is the star of the class. He is very intelligent (even the instructor has said so) and learns quickly. He is very food-motivated, which also helps. Landry gets his third visit to the vet this coming week. Our vet, Dr Neeman, thinks he is in great shape. I think he looks a little skinny, but it is probably just because he is so tall. Gary is about 5’11, so you can see in the “Landry Stretch” picture that Landry has grown a bit. Jethro is a bloodhound mix I adopted from ARK in April. He is about 1 year old now and doing great! He is just as loveable and friendly as he was the day I first met him. He LOVES meeting new people and can't sit still when someone new is around. He has a big backyard to run around in now and loves playing fetch with his tennis balls. As you can see from his pictures, we often take trips to the lake and he loves to hang his head out of the window to smell everything. He has been a wonderful blessing, thank you! 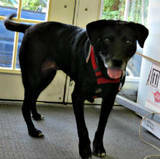 Hi my name is Jacqueline, I have adopted this lab/mix at the 2011 Dogwood festival in Idabel from ARK. I just wanted to put a post and some pictures of her on here so you all can see how she is doing. She is a healthy 10 pound puppy; she gets wormed and gets flea medicine when she needs it; she is up-to-date on all her shots; she has a new name which is Tinkerbell. I named here this because when I brought her home to her new family she was really playfull and a little fiesty like the cartoon character Tinkerbell. She has many family and friends and is doing wonderful. She comes inside sometimes when it storms but on the storm we had on 4-25-11 she made it through this tornado and hail and she is wonderful with childern and loves to play ball and catch. She has learned alot; she has learned how to stay and she is learning how to sit and ride in the back of the truck. She loves to be spoiled and she loves my other dog; she sleeps with him and when we get her away from him she whines until we put her back with him. He is an older dog so he is protective over her. She climbs all over him and here is a picture of her and him and a picture of her sleeping. 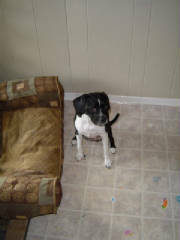 We adopted Shandie in October of 2008 when she was about 4 months old. She has been such a blessing. I could not have dreamed up a better dog. Shandie is well trained, does approximately 20 tricks, tracks deer (the hard to find type) which she loves to do and cuddles like nobody's business. She guards the house and my teenage sons with gusto, loves the whole family but is definitely momma's girl. She follows me room to room and really loves her "chelly rubs". This dog is so in tune with her entire family, she knows if someone is sad or sick and she "takes care" of them. At 40 pounds she is also a perfect size, big enough to scare off any intruder and small enough to cuddle up next to me on the couch. I want to say a big thank you to ARK for trusting us with this very special dog. Adding her to our family was one of the best decisions I have ever made. Hello all ! Just a note to let you know Butter is doing great!! She is such a big part of my life now & loves every minute. She loves to go on the boat fishin & loves loves to go swimming. I want to thank ya’ll so much for letting me take her. TAZ - A Precious Gift! ...............I am so happy................ I love my "Forever Family"! We got Taz December 5th we have had her 9 weeks and 3 days and we couldnt ask for a better dog than her! She is our precious gift! We absolutly Love her and that was just a picture to show everybody how shes doing and how big she has got. We took her to the vet and she weighed 27.4lbs. Shes a big one(: But we love her and if it wasnt for you guys we wouldnt have her. You guys have been really good and patient with us so we just wanted to thank you guys for giving us such a loving gift. 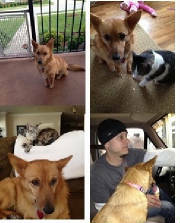 Carl, Pat, Courtney, Emmy and of Course Taz! What a great life I have! ! ! ! ! ! ! ! I LUV IT!!! She is GROWING!!! The kids just love her, Rowdy just loves her, and we just love her!! She is such a CuddleBug!! She loves for us to throw her ball, and she loves to play chase. What a great addition to our family!!! Time for a snooze with my friend! Relaxing with my best buddy. I am a big boy now! 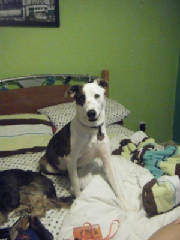 I adopted Camo from the shelter in November of 2008! He was 7lbs when I adopted him & 12 weeks old. He is now 40 lbs & will be 2 years old in August! Camo LOVES to play fetch, run around, & swim! His favorite place is either at the lake or snuggled in your arms! He is the sweetest boy ever & I couldn't imagine life without my baby boy. My other dog, Kloey, Took very well to him when I first brought him home. 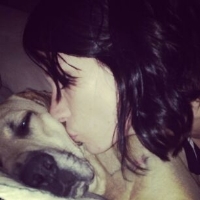 She is very maternal and cleans his face for him and snuggles with him at night. He is a big goof & a klutz! Camo keeps the entertainment alive and a smile on everyone's face! Thank you so much for this beautiful dog! Here are a few pictures to update you on Tanner; he's turning into quite a character! He now weighs 60lbs and is growing into those long legs. different story. He has no interest in getting in, and doesn't understand why the other two love diving in to get toys. We adopted Sadie a little black and white Boston mix last September from you guys. I just wanted to tell you guys thank you. She is the best kids pet ever. She came to us crate trained, but I pleased to say she has never had an accident . You guys perform a great service and I just wanted to say thank you. I have enclosed some pictures of "Casey" my daughter changed her name. My son calls her "Queso" which means cheese in spanish. We can't figure out why he calls her this, but she comes to both. And her new Mom - a wonderful match. So Happy! A nap in a nice sunny spot! We have watched beautiful Bella grow into a beautiful young lady. She's about 7 months here. Going for a ride with my girls! Sadie was adopted in January, 2010. A very Happy Tail!! My sweet Dixie-Ollie are sending you love. Thanks for ALL you at ARK do for the animals. My barn kittys are front porch kittys. They are great hunters-mice, birds and snakes. They always bring them on the porch for me to see. They are still shy around strangers, just know our voices-take off when others come around. Sophie is 8 months old and weighs 2 lbs. She is tiny due to encephilitus. Her vet says she is a miracle pup and remains on prednisone and lasix to treat the swelling around her little brain. Sophie's birth mother was rescued from the greenboxes at Battiest, where she had been dumped, when she was ready to deliver puppies. 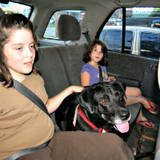 Her rescuer took her home and she gave birth to Sophie and her siblings. ARK assisted with finding homes for everyone. 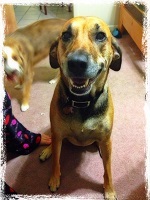 Sophie has an amazing owner, who maintains regular vet visits to control her health issues. She is one lucky puppy! She travels back and forth to work with her adopted mom daily and visits with residents who live in an assisted living environment. SANTA, WE HAVE BEEN VERY GOOD!! 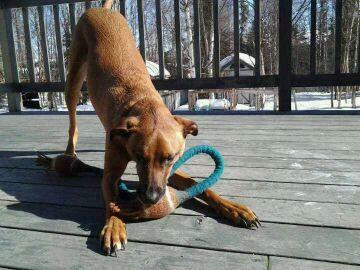 This is Kobe aka Red found in Golden as dump puppy. Adopted 2 yrs ago by couple from Anchorage. He is treated like this couple's child lol! His bestie is Sage, a pit mix also a rescue. I love living with my family in ALASKA!! This is Mr. Sammy Wilson. My mom works with ARK and does some fostering also. 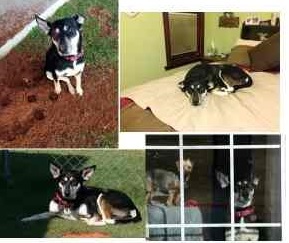 One late afternoon in early fall of 2010, Mom received a phone call asking if she would foster a small dog, one that was about to be tossed out a window while the car was traveling down the road just because he was not wanted. My Mom said she would try to help out. Little did we know that this tiny Chorkie was only three weeks old and had to be dropper fed every three hours. I was in college and could hardly wait to come home to meet this little orphan. Have you heard of "love at first sight"? This is exactly what I experienced with this little chorkie. I immediately made plans to take him back with me to college, fully knowing I had to get up every three hours to feed him AND come home from classes at lunch. (I lived in an apartment.) Sammy is a very spoiled little man; he is so spoiled that he does not even know he is a dog (literally). He lives life to the fullest and always has a great attitude towards anyone he meets, for he is so loving. Sammy is practically our sorority mascot, as well as the fraturnity mascot that my boyfriend is part of. 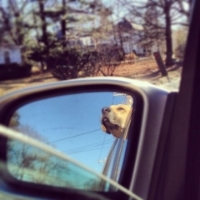 He enjoys riding in the car and looking out the front window during the ride. Oh, and of course, he is a huge cuddler! Sammy always keeps a smile on my face and he is truly an example of "a mans best friend". Sammy IS a success story! Thank you ARK for doing what you do! Beth W.
and I can play and have fun! and looking out the window! I am a happy boy! At my new forever home. I really love my toys and new bed! 10 months old and 20 lbs! Doing wonderful! Wanted to give you an update on Freckles. She is growing like a weed and doing great!!!! 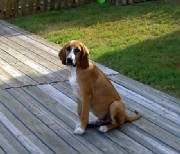 Freckles has learned how to Sit, Stay, Lay Down, Crate trained and House broken (Yeah!!!!). She will “Come” on her own time but we’ll keep working on it. She loves pig ear chews, to roll in the grass, going to the park and now has a “brother” to play with. He was named Wishbone at the shelter but we have started calling him T-Bone for some reason, don’t know why. Ringo likes to "sing" and loves to play with the other dogs. He is going to be a big one! He is absolutely beautiful!